Vanessa Valore combines a background in fine arts with a dedication to the execution of murals. The result is a bold new contribution to the design of interior spaces. One of her largest creations, an elegant seascape featuring mermaids and seahorses, grace the walls of Il Piatto, one the hottest restaurants in New Orleans, LA. Owner Matt Yohalem, with primary investors Robert De Niro, and David Yurman, chose Valore to design a mural that would complement the menu's seafood theme, as well as add a strong sense of whimsy to the dining experience. 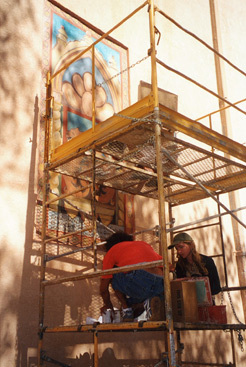 Valore has been commissioned to create custom artwork, including an etching for the New York City home of Metromedia President John Kluge, and large scale murals for Santa Fe landmarks, such as the Lensic Performing Arts Center, the exterior of Burro Alley, the historic Compound Restaurant (recently revitalized to the original Alexander Girard design, one of America's early folk art pioneers), the four star Fechin Inn in Taos, N.M., and the Hyatt, outside Albuquerque, N.M. She also has fine art placed in the Governor's Gallery in the State Capitol building. Her work has been recorded in the Historical Archives Department, as one of the youngest artists to be bestowed such an honor. The quality of light in Santa Fe provides inspiration for Valore's work, as does the stark beauty for which the region is known, especially in the surrounding countryside of Abiquiu. Valore is also strongly influenced by her extensive travels in southern Spain and northern Africa, which lend a Moorish influence to her murals. Santa Fe, as a major international art market is the home of the Georgia O'Keeffe Museum and Site Santa Fe. "Murals are the perfect medium for me and I'm fascinated by their permanence throughout art history," says Valore. Murals are large enough to capture the images of an enchanted imagination. "I began working in a large scale format, on wall murals and large canvasses, early on in my training under the instruction of Donald Sanders in New York City." Vanessa Valore was born in Philadelphia and began formal art training at the age of five. She moved to New York City at 16 years of age to attend the prestigious Professional Children's School, dedicated to the study of all fine arts. 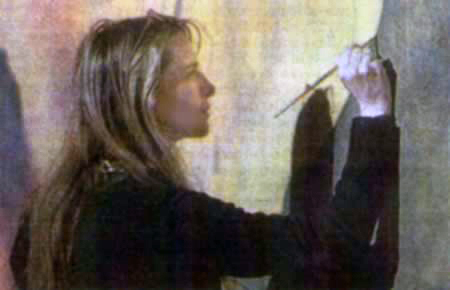 While there, in the company of classmates such as Uma Thurman, Valore began work on her first large scale murals. 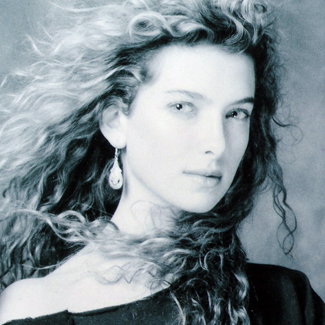 She graduated with high honors and went on to attend Parson's School of Design. She moved to Santa Fe and obtained her Bachelor of Arts Degree in Studio Art and Art History from the College of Santa Fe. She established Valore & Co. in Santa Fe in 1990, and today oversees the work of other artisans. Ms. Valore is presently chair of the Interior Design Board of New Mexico, and is a member of the Film Advisory Board. She is a writer and guest lecturer, as well. Recent lectures include the Pacific Design Center in Los Angeles, and Canyon Ranch in Tucson, Arizona which is consistently ranked as "Best Spa" by numerous travel publications. Valore moved the company to Los Angeles in 2003 and continues to work throughout the country. Her specialty has been custom artwork for celebrity cliental over the past several years and she continues on large commercial projects nationally.